Guild electric guitars have long been some of the most unique and desirable electric guitars on the market. While Guild is often thought of as primarily an acoustic guitar company, they have created some memorable electric guitars over the years. These great electric Guilds are vintage instruments now and are considered collector's items in certain circles. Guild M-75 - The M-75 enjoyed a curious history of production having been introduced in the early 1950s and discontinued in 1962. This model was brought back in 1967, and it was produced again steadily until the mid 70s when it was discontinued once and for all. In its earliest incarnations, the M-75 Aristocrat was a semi-hollow body guitar, even though it was modeled after the solid body Gibson Les Paul. It had a Honduran mahogany back and sides, a spruce top with gold hardware, a rosewood fingerboard and a sunburst finish. It was equipped with Guile Frequency Tested soap-bar pickups that worked well for both clean jazz tones and searing rockabilly licks. When the M-75 returned in 1967 (dubbed the Bluesbird), it had a thicker body and was offered in both semi-hollow and solid body models. Guild Bluesbird - When Guild began manufacturing electric guitars again in the late 1990s and early 2000s, the Bluesbird was one of their main instruments. A quick glance will tell you that this guitar shares many similarities with the Gibson Les Paul, from the body shape to the arched top to the twin humbucker pickups. 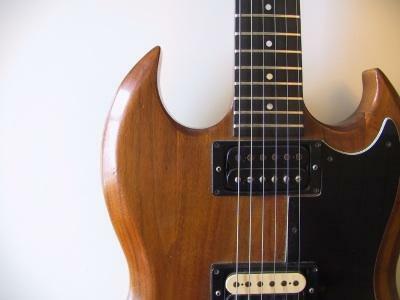 Guild S-100 - Modeled after the Gibson SG, the Guild S-100 was a thin ,solid mahogany electric guitar with two humbucker pickups and the signature Guild angled block stop tailpiece. These are great sounding guitars that were made famous in the 1990s as being the guitar of choice for Soundgarden's Kim Thayil. Guild S-50 - the Guild S-50 is another unique and rare guitar from Guild. Produced as the company's first solid body guitar in 1963, the S-50 features a single Guild humbucker and a six-on-a-side headstock similar to Gibson's Firebird. These are truly collector's items that would add a lot to any guitarist's eclectic collection. Since Guild electric guitars are used and somewhat rare, you have to put your time in to find the right instrument. Of course, eBay is always a great place to start looking, as well as Elderly Music. Checking the Craigslist page for your area is also a good way to find a used Guild in need of a good a new home.